This page aims to help you remove My Inbox Helper. Our removal instructions work for Chrome, Firefox and Safari, as well as every version of Windows and MacOS. If the invasive online ads that show up on the screen of the browser you are using have recently significantly increased in numbers and now seem to spread to all sites that you go to and also your ad-blocker can no longer stop them from appearing, then you may have a hijacker in your browser (could be any browser – Firefox, Safari, Chrome and more). Though “browser hijacker” may sound scary and intimidating at first and though it may even make you think that this is a threat like a Trojan Horse virus or some nasty and malicious encryption-malware like a Ransomware cryptovirus, the browser hijacker software components are actually not tools intended to cause harm. Sure, they may tinker with your browser, give it a new (and possibly not very useful) search engine, change the default homepage and also get you page-redirected or suddenly open new-tabs while you are browsing, but the truth is that none of this is directly supposed to expose your computer to danger and security hazards. Of course, this doesn’t mean that the browser hijacker isn’t annoying or unpleasant to have – quite the contrary. Such apps can make it extremely difficult and rage-inducing for you to browser the Internet and to actually reach the sites and the pages as well as reach the information that you’ve been looking for. This is why the majority of users who get to experience this in their browsers are determined to find a way to uninstall the invasive software and, by doing so, get rid of its ads and unwanted changes in the browser. 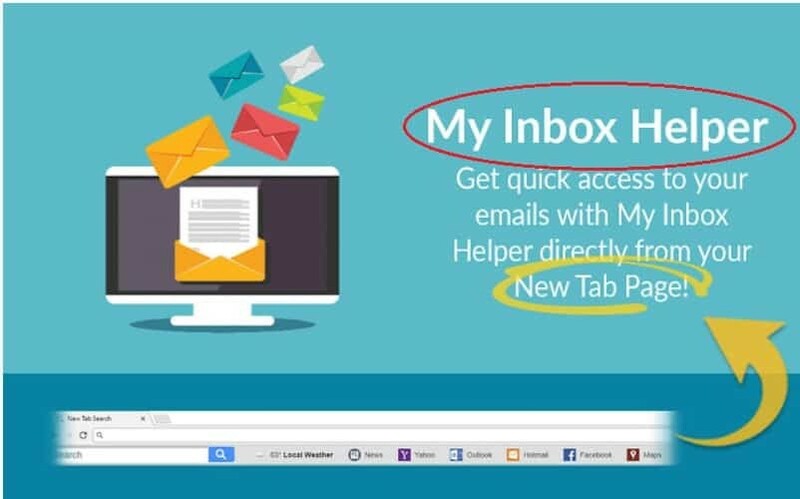 Though doing this may not always be the easiest of tasks, we can help you out with this predicament by showing you our guide on how to eliminate a hijacker named My Inbox Helper – this browser hijacking app is a new addition to its respective software family and we believe that most of the readers of this article have come here precisely because of the My Inbox Helper hijacker in their systems. It is totally understandable if you can’t recall how this annoying My Inbox Helper app has actually gotten added to your browsing program. Though the hijackers can’t exactly infect your machine in the way a Ransomware cryptovirus, a Spyware infection or some nasty Trojan Horse can, they are still quite good at getting themselves installed in the users computers without being noticed. A commonly used technique for the distribution of unwanted software like the hijackers is when the offending app is bundled with some other programs inside a setup package. Oftentimes, the users tend to install such setup packages without really paying much attention to what extra components may have been added in there. Of course, if you check the Advanced menu in the setup, you should be able to see the bonus components and leave out the ones you don’t like but most people forget to do that or simply do not think it is an important thing to do. You, however, should always do this in the future whenever you are about to install a new program in case you don’t want to end up with another hijacker in your system. Symptoms If your browser gets swarmed with ads on every site you go to, then you likely have had a hijacker installed in your computer. Distribution Method Spam messages, different forms of misleading web content and software bundles could be used for distributing apps like My Inbox Helper.